What should I know about strep throat? What is strep throat? What causes it? How is strep throat spread? How long is it contagious? What are the common signs and symptoms of strep throat? What are other signs and symptoms of strep throat? Are the signs and symptoms of strep throat in infants and toddlers? What tests diagnose strep throat? What natural and home remedies help soothe strep throat pain? What over-the-counter (OTC) medication soothes strep throat pain? What antibiotics are prescribed to treat strep throat? What are potential complications of strep throat? How can I prevent contracting strep throat? Strep throat is a type of infection caused by group A Streptococcus bacteria that results in a sore, inflamed throat. Most sore throats are caused by viruses, not strep bacteria. Symptoms of strep throat in infants and toddlers may also include a thick nasal discharge, reduced appetite, fussiness, and swollen lymph nodes. Symptoms associated with an upper respiratory infection (a "cold"), such as nasal congestion, muscle aches and oral blisters, are typically absent with strep throat. Strep throat is highly contagious and is usually spread through direct person-to-person contact. The diagnosis of strep throat is established either via a rapid strep test (RADT) or a throat culture. Strep throat is cured with antibiotic therapy. While rare, there are several complications that may develop from a strep throat infection. Strep throat is a bacterial infection of the soft palate and tonsillar region. 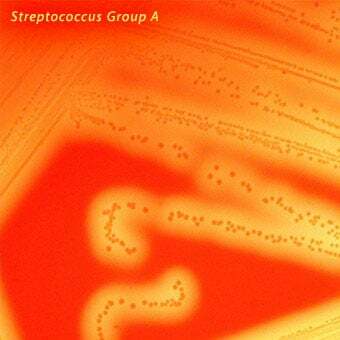 Microbiologists identify the member of the Streptococcus bacterial family that causes strep throat as "GAS" (Group A, beta hemolytic, Streptococcus pyogenes). Strep throat is most common in young children and adolescents, but it can also occur in toddlers and adults. Strep throat is highly contagious and it is present most commonly in the community during the winter months. Symptoms and physical signs of strep throat may vary depending upon the age of the person infected. Strep throat is highly contagious and is most commonly spread via direct person-to-person contact. The incubation period (the time it takes from exposure to the infection to the appearance of symptoms) for strep throat is two to five days. Passage of airborne droplets and/or saliva from the infected individual to another is the most likely mechanism of contracting strep throat. Close quarters (such as the home, classroom, day care centers, college dorms, etc.) provide an ideal environment for passage of strep bacteria from one person to another. The risk of contracting a strep throat infection is approximately 40% in household environments. Most infectious disease specialists believe that a patient is no longer contagious after 24 hours of effective antibiotic therapy. Spread of strep bacteria via food borne transmission is less common than direct person-to-person exchange of droplets or saliva. The exact likelihood of developing strep throat from family pets is unknown, but most experts believe it is minimal. Strep throat will usually get better on its own within two to five days, however, you may start feeling better within a day or two after antibiotics are started. Strep throat remains contagious for the first 24 hours after starting antibiotics, so it is recommended that people stay home from work or school to avoid spreading the infection. Runny nose, cough, hoarse voice, muscle aches, diarrhea and oral blisters are generally not seen with a strep throat infection. These symptoms usually indicate a sore throat caused by a virus. Adults with strep throat may have milder symptoms that may not prompt a medical evaluation unless an exposure history to strep throat is known. A diffuse rash over the torso and groin region. The classic description of this rash is that it looks like "goose bumps on a moderate sunburn". The presence of a strep infection and this specific rash is termed scarlet fever. This diagnosis does not imply a more severe strep infection or imply any change in prognosis or management. The rash is not contagious. Some indivduals who develop acarlet fever may also experience peeling of the skin of the finger tip pads. While most patients with strep throat will experience these signs and symptoms, not all will necessarily be present in each individual. The information above is seen in those most likely to have a strep throat infection, including older children and teenagers. However, other age groups may experience some different symptoms with a strep throat infection. Infants with strep throat more commonly have a thick nasal discharge, low grade fever (< 101 F [38.33 C]), reduction in appetite, and fussiness. Toddlers (children from one to three years of age) with strep throat may complain of a sore throat and a subsequent decrease in appetite, and swollen lymph nodes in the front of the neck beneath the mandible (lower jaw bone). There are two common tests used to diagnose strep throat the rapid strep test (RADT) and traditional throat culture. Many medical offices, clinics, and hospital emergency departments use a rapid strep test (RADT - rapid antigen detection test) to diagnose strep throat. A throat swab is obtained from the back of the throat and tonsils, and a RADT "kit" is employed to help determine the presence or absence of the strep bacteria. The turn around time for results of the test generally is 10 minutes. RADT tests are about 70%-95% accurate in determining the presence of strep bacteria. Most guidelines recommend that a negative rapid strep test be confirmed with a throat culture, which can take a few days to get the results. Antibiotic pretreatment prior to obtaining a throat swab for strep bacteria can interfere with throat culture results, and thus the ability to correctly diagnose and treat a strep throat infection. Antibiotic treatment prior to a rapid strep test is less likely to have a false negative result since the test is designed to document the presence or absence of the GAS bacteria. Residual dead bacteria in the patient may allow a positive result. The traditional test, a throat culture, involves obtaining a swab from the back of the throat and tonsils. It takes approximately 24 to 48 hours to determine the presence or absence of the group A strep bacteria. This test is typically more accurate in diagnosing strep throat than the rapid strep test. The antibodies that these tests are sensitive to are not commonly present until a few weeks following an acute strep infection. These tests may be ordered when evaluating a patient who may have developed delayed complications (such as rheumatic fever or glomerulonephritis) after a strep throat infection. Treatment of a strep throat infection includes the use of antibiotics and over-the-counter medications and home remedies for the reduction of symptoms. 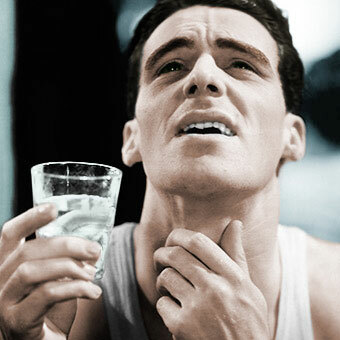 Saltwater gargle: mix ¼ to ½ teaspoon with 8 ounces of warm water. Young children may accidently swallow the solution instead of gargling it and should thus avoid this approach. 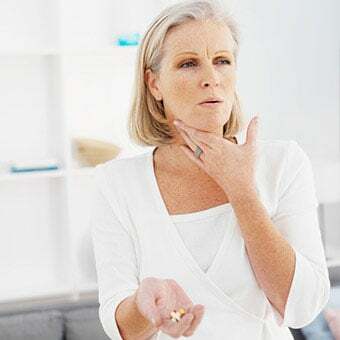 Throat lozenges may be sucked on to reduce the symptoms of pain or throat dryness. Some lozenges contain topical anesthetics. Very young children should not be given throat lozenges, as they may be a choking hazard. Throat sprays that contain topical pain relievers (benzocaine, phenol) may be used to relieve sore throat pain, though lozenges often provide more long-lasting relief. Hot or cold foods and drinks: Ice cream, smoothies, popsicles, cold drinks, warm (not hot) broth-based soup, and warm tea with honey may help soothe the sore throat. Honey should be avoided in infants less that 1 year of age because of their increased likelihood of botulinum toxicity and paralysis. Several over-the-counter (OTC) medications, such as acetaminophen (Tylenol) and nonsteroidal anti-inflammatory drugs (NSAIDs) such as ibuprofen (Advil and Motrin) can be used to lower the fever and provide pain relief for the sore throat. Aspirin should not be used in children or adolescents because of its association with Reye syndrome. Antibiotics provide the mainstay for successfully treating a strep throat infection. the cephalosporin family, for example, cephalexin (Keflex), cefprozil (Cefzil), cefdinir (Omnicef) and others. Members of the macrolide family, for example, erythromycin (E-mycin), azithromycin (Zithromax) and clarithromycin (Biaxin) generally are felt to be less effective than the other two classes of antibiotics, but are used in individuals with moderate penicillin or cephalosporin allergy. If such a patient cannot tolerate the macrolide family, clindamycin (Cleocin) is an alternative and very effective antibiotic option. Regardless of what antibiotic is prescribed, it is important to finish the entire course of the antibiotic. Most patients will experience a rapid reduction in signs and symptoms within 24 to 48 hours of starting antibiotic therapy. Viral throat infections do not require antibiotics since they provide no benefit. Is it safe to take antibiotics for strep throat during pregnancy? If a woman contracts strep throat during pregnancy, the same types of antibiotics are typically used for treatment. All penicillin-type and cephalosporin-type antibiotics are considered safe for pregnant women. Because fever is a common symptom of strep throat, pregnant women are advised to take fever-reducing medications such as acetaminophen (Tylenol). Aspirin and NSAID’s should be avoided during pregnancy. Consult your doctor if you are pregnant and you think you have strep throat, and follow your doctor’s instructions for medication use. Which specialties of doctors treat strep throat? Strep throat is typically diagnosed and treated by a primary care provider (PCP) such as a family practitioner, an internist, or a child’s pediatrician. If you go to a hospital’s emergency department, you will be seen by an emergency medicine specialist. 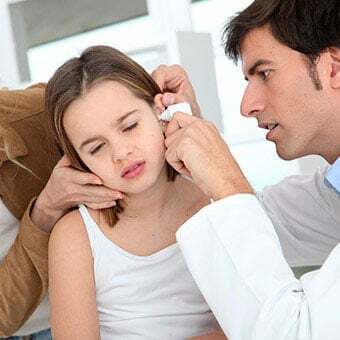 If you have recurring or chronic strep throat, you may be referred to an otolaryngologist, sometimes referred to as an ENT (ear, nose, and throat specialist) for treatment. Acute rheumatic fever (ARF): While rare, this complication of an untreated or inadequately treated strep infection can have devastating and lifelong consequences. It is believed that due to incomplete eradication of the strep bacteria, certain GAS organisms cause an immune response, which may attack the joints leading to permanent arthritis. More concerning is the autoimmune response to the heart valves, which may damage them and may result in heart failure. Many studies have shown that effective and appropriate antibiotic therapy for strep throat vastly reduces the likelihood of developing ARF. Glomerulonephritis: Similar to the abnormal immune response seen with ARF, antibodies may develop and damage the microscopic filters (glomeruli) of the kidney. This complication more commonly affects children between 7 to 10 years of age. While more common than acute rheumatic fever, glomerulonephritis has a less serious prognosis. Effective treatment exists and most children make a complete recovery and do not experience any long-term kidney damage. Unlike ARF, the development of glomerulonephritis is not necessarily prevented by effective antibiotic treatment. PANDAS (Pediatric Autoimmune Neuropsychiatric Disorder Associated with Strep): Specialists debate the proposed link of a GAS infection in children with the development and/or worsening of obsessive-compulsive behaviors or tic disorder (Tourette's syndrome in the extreme). One area being researched in this controversial condition is whether antibiotic therapy effects the development of, or the severity of, the disorder. Avoid people with sore throats, and especially those with documented strep throat, until they have taken antibiotics for more than 48 hours. Wash your hands frequently after using items which may harbor the group A strep bacteria (for example, dishes and utensils). Don't share food or drinks with a sick individual. Encourage ill individuals to cover their nose and mouth when they sneeze or cough. American Pregnancy Association. "Strep Throat During Pregnancy." Schmitt, B.D., MD. "Strep Throat Exposure." Seattle Children's Hospital Research Foundation. Stead, W., MD. "Patient education: Sore throat in adults (Beyond the Basics)." UpToDate. Updated: Nov 07, 2017.